It’s popular, this time of year, to speak of goals and resolutions. I am not a fan. Sure, we all have things we’re wanting to accomplish; failings from the last year we’d like to avoid, gym memberships we’d like to be using and dietary changes we do not adhere to. Do we really need to set up more goals or do we need to dig a little deeper and talk a little more about adjusting our priorities? PRIORITY. Priority is where all the power is. Priority can destroy all your beliefs about what you think you can or cannot do. Priority is the key to attainment. We can do lip service setting goals and resolutions around anything we wish to accomplish – but if that thing is not high on our priority list – if we do not even possess a priority list – then it’s still not gonna happen. If it’s important to me, it moves to the top of my priority list. If it’s important to me, I have the time for it. If it is important to me, it is GOING TO HAPPEN. 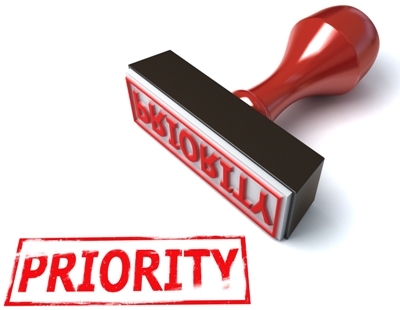 Priority turns what looked hard into something quite simple. The hug or the criticism? The cupcake or the apple? The deep breath or the harsh word? The water or the beer? The TV or the treadmill? The easy smile or the worried frown? The judgement or the understanding? My choices tell me (and you!) a lot about who I am being in the world. If I want to improve on who I am being, then I best think about what is most important to me – I best organize my priorities.